Despite Jose Mourinho wearing a consistent scowl on a frustrating transfer deadline day, striker Romelu Lukaku and new arrival Fred were able to share a laugh and a joke as the Brazilian underwent a drugs test. Fred’s £52million arrival from Shakhtar Donetsk earlier this summer has proven to be United’s only marquee signing of the window with Mourinho and supporters frustrated at the lack of new faces. 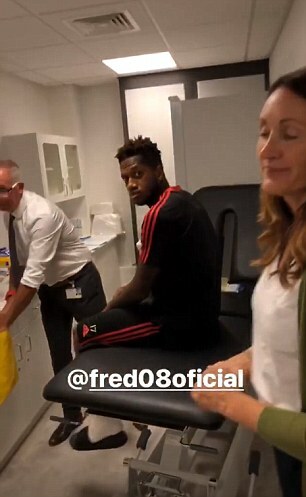 But while mood in the management team is rather flat, it appears Fred has bonded well with his new team-mates as Lukaku poked fun as the midfielder sat on a bench, ready to be examined. The Brazilian has been one of the bright lights for United supporters since joining up with the squad after World Cup duty. Featuring in a handful of matches in pre-season – including against Champions League winners Real Madrid and Bundesliga champions Bayern Munich – it is hoped he can prove a major force in the middle. He is expected to feature alongside Nemanja Matic, ruled out injured by Mourinho for the Leicester tie, and World Cup winner Paul Pogba when all are fit. It has proven a tough few months for United since they were beaten in the FA Cup final by Chelsea with an unimpressive pre-season tour coupled with lack of transfer activity. In a bid to arrest their issues with securing a defensive target, the club made a lucrative two-year deal to Atletico Madrid hard man Diego Godin – only for the Uruguay captain to reject a switch to Old Trafford. Mourinho desperately wants to bolster his back line as well as add a versatile forward with Ousmane Dembele, Harry Maguire, Jerome Boateng and Toby Alderweireld all mooted during the summer. But with United opening the 2018-19 Premier League season on Friday evening against Leicester, the players they do possess were focused on the job in hand at training on Thursday morning.